Today was the day. I was finally going to be attending my session on wireless dimming. While this session was in the evening I had no time to waste. So I spent my morning exploring the Expo some more. During my exploration I discovered two different sources for wireless dimming products other than RC4 wireless dimming. nd the second was the W-DMX product from Wireless Solution Sweden AB. While this was very interesting and cool to see what else is out there, as I said before these products were made for much bigger uses than what I needed them for as well as these are much more expensive than the RC4. When I attended my session I found that the dimming and technology he was planning to talk about that was more specified to motion control rather than for dimming lights. Due to the fact the audience was fairly small he actually asked us what we wanted to learn about and the crowd wanted to know about dimming lights which saved my life. The most important thing he talked about during his presentation was about batteries which was very interesting to me and very important to know about for wireless dimming. § If run down to dead it will only recharge to 80 percent of it’s original power. Each time it is used till dead it will only recharge to 80 percent of the outstanding power. § Wireless dimmer companies allow the batteries to be drained completely rather than having them shut off at the right voltage because if they were shut off the batteries may not complete its use in the show. o It likes to be used very little, but be charged a lot. § It is necessary to be very diligent at checking batteries making sure they are charged well and correctly. § If not taken care of it will become costly to replace numerous batteries. § For cost effectiveness UB Department of Theatre and Dance should invest in a versatile battery charger. § It is said that some batteries have an effect that if the battery is only used a little bit before being attached to a charger consistently, the battery will remember how its used and soon if you try to use the battery it will start dying a lot earlier than it should. § The solution to the memory effect is to use these batteries until they are completely dead so you are able to keep the full use. w me away and completely absorbed me. One thing I did not miss on the tech side of the show was when wireless dimming was used in a way I didn’t think was possible. 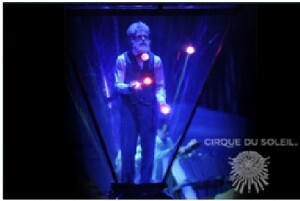 During the show there is a moment where this man is juggling these balls that are lighting up and changing colors. At first I thought that maybe the LED’s in the balls are preprogrammed to change as they do but after speaking with the people at the Cirque Du Soleil booth at the Stage Expo, they said that the balls are actually being controlled with wireless dimming.